Image taken in Rackensack Canyon, Maricopa Co., Arizona. 31 May 2008. This brightly colored predator can deliver a painful bite if mishandled The argent orange color is probably aposematic and likely a warning to birds or others that might be tempted to turn the tables on this predator. 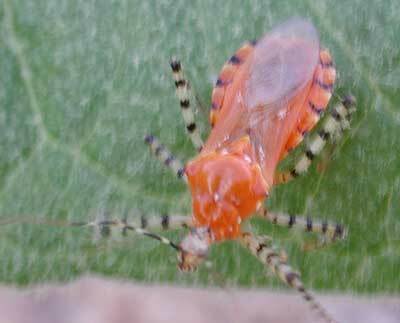 This insect, a true bug in the family Reduviidae, was found hunting on foliage of Arizona Sycamore -- Platanus wrightii.